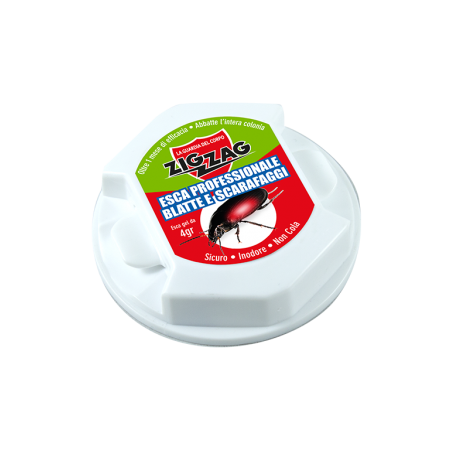 Hard plastic trap ready for use, with 4 g gel bait containing an attracting agent and cockroacheskiller. Safe for children and pets. Odourless, it does not drip or soil. Destroys the entire colony in 24 hours. Notes: The hard plastic box ensures the safety of children and pets as it prevents them from coming into contact with the active principle. The single-trap sales unit means that those who only need one trap can spend less (with lower cash needs). The main competition sells 2-piece blisters. Break the three pre-cut strips by pulling them out of the box to allow the cockroaches to enter. Apply the product on the passage of the cockroaches, along the walls, at the entrance of their nests. Replace the box, if necessary, after 15-20 days. Along the walls, along the habitual path of cockroaches. The cockroaches entering the box attracted by a sugary substance, come into contact with the bait and eat it. Before dying, they have time to re-enter the nest and contaminate the entire colony, which will be destroyed.